How Did MH370’s Flaperon Come Off? In my last post, I reviewed Malaysia’s analysis of the MH370 debris its investigators have gathered. Not included in that study was the flaperon found on Réunion, as it is being held by the French. 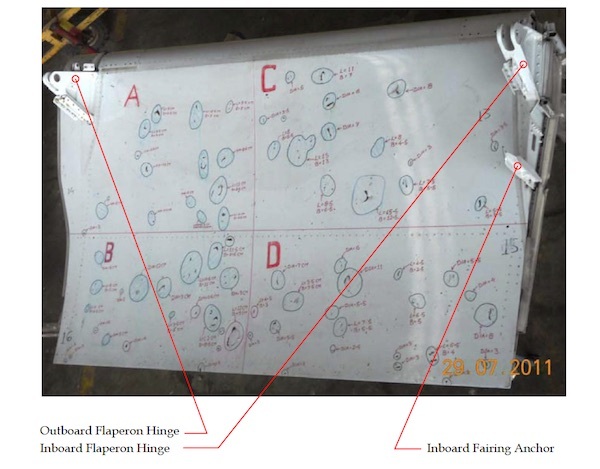 So today I’d like to look at what the damage patterns seen on the flaperon suggest about the crash, based on the work done by IG member Tom Kenyon and by a reader of this blog, @HB. The lesser attachment points failed in a similar way. That is to say, they did not rip away the flaperon structure to which they were attached. The location of the failure points of Flaperon hinges is consistent with a large singular lateral force or repetitive lateral (or torsional) movement of the hinges in the inboard/outboard direction. If Flaperon was separated from the Flaperon hinge with forces in forward/aft direction or by applying forces to the Flaperon in the extreme rotated up/down direction (beyond structural stops) then deformation of the Flaperon structure due to such forces would be evident. Significant and permanent deformation of the Flaperon structure does not appear to be present in photographs of the Flaperon. Recall that two scenarios have been proposed for the flaperon coming off 9M-MRO: either the plane hit the water, or it came off as the result of flutter in a high-speed dive. Neither event could reasonably be expect to produce a primarily lateral (that is side-to-side) force on the flaperon of the kind Kenyon describes. No significant evidence of secondary structural damage excludes a massive trailing edge strike and leads the author to conclude that the Flaperon separated from MH370 while in the air and did not separate from the wing due to striking water or land. In other words, since the damage isn’t consistent with a crash into the sea, we can deduce that flaperon must have come off in the air. The only conceivable cause would be high-speed flutter. However, on closer inspection the evidence seems to rule out flutter, as well. For the flaperon… the lift/drag load is normally passed on the honeycomb panel over the exposed surface area then the primary stucture of the component (the aluminum frame of the flaperon) then the hinges then the primary aluminum stucture of the wing. In a nut shell, those panels are not designed to sustain any in-plane loads either compressive or tensile. They are just designed to resist bending due to uniform lift load on the surface (top FRP layer in tension and bottom FRP layer in compression, the honeycomb is basically maintaining the distance between the layers without much strength).Those panels can arguably take a little bit of shear load due to drag forces on the top skin (top and bottom forces in opposite direction) but not much due to limits in the honeycomb strength. The second thing to consider are the GRP properties. The GRP is very tough in tensile mode, much stronger than Steel. In compression mode, it buckles easily and only the honeycomb is preventing this. This is by far the weakest failure mode. If it fails, you will see fibres pulled out link strings on a rope failing under tension. For the skin under compression, you will see sign of compression on the honeycomb but the fibres will have to be pulled out as well. Also, a perfect manufacturing does not exist, there are always delamination (small bonding defects) between the honeycomb and the GRP skin to weaken further the compressive strength. The hinges are usually much stronger as all the load is passing through them (analogy door hinges). So you could imagine, if there is a large impact the hinges are expected to fail last. The part of the skin that will buckle is expected to fail first. I would tend to agree that the hinges have been subject to cyclic fatigue… the hinges appear to have been subject to cyclic lateral forces which are not expected in any accidental circumstances (take door hinges, for instance, and imagine the hinge fail after 50 times someone is trying to burst through – you can try at home but it is very unlikely to happen). This of course requires a closer look by experts to double confirm. I cannot think myself of any possible lateral force on this part in the first place but a lateral force that will fail the hinges and not the skin which is weaker is very hard to explain. Try with a wooden door and tell me if you manage. • Why are the official investigators silent on releasing preliminary reports on their Flaperon analysis? Why would France’s Direction générale de l’armement / Techniques aéronautiques (DGA) release photographic data to ATSB and yet chose not to make Flaperon Analysis findings public after such a long period of elapsed time? To sum up, a close examination of the flaperon’s breakage points does not yield any comprehensible explanation for how it came off the plane, commensurate with a terminal plunge into the southern Indian Ocean. This is baffling but unsurprising. Every time we look at the debris data carefully, we find that it contradicts expectations. The barnacle distribution doesn’t match the flotation tests. The barnacle paleothermetry doesn’t match the drift modelling. The failure analysis doesn’t match the BFO data. And on and on. Frankly, I don’t expect the ATSB (or any other government or agency) to answer any more questions on anything. In the case of the ATSB, the reason is that they have often repeated, and deliberately emphasised, that they are nothing more than an “obedient child” doing what the “commanding parent” (Malaysia) demands. The classic pontious pilot approach. I don’t expect the French to answer any questions on anything either – ever. Their legal system seems to preclude that outright. The Malaysians have stated that “the final report” is in draft, and have promised that it will be released later this year. Whether or not it will be a report worth reading or not (personally I doubt it) remains to be seen, if indeed, it is seen by anyone before New Year’s Eve (if at all, ever). So, come 1 January 2018, when we are faced with nothing “definitive”, from any government, what do we do then ? Just keep chasing our tails “till kingdom come” ? It seems all the involved governments are now more than happy to let us do that, to our heart’s content, since for them, MH370 has now descended below their radar horizon (so to speak), of the public’s, and specifically, the mainstream media’s, “noise threshold” detection limits. In other words, they don’t care what we do, say, or think, anymore (if indeed they ever did is even debatable). We need a strategy for post 1 January 2018, one which will hit their “alarm buttons”, figuratively equivalent to an inbound sea-skimming cruise missile threat suddenly popping up on “their” radar display. @Ventus. First, the ATSB and Malaysians will not come up with a eureka in their Search and Final reports. Were there one we would have heard of it. Currently there is no overwhelming majority belief in the new search area. Without that and while assumptions undermine all search probabilities as they do there will be no more searching. Also remember that even finding the aircraft might not help with the cause of the crash. I hope the Malaysians have a two pronged approach in mind. First, the most likely source of increased confidence in where a new search should be is in more refinement to drift analysis, entailing more funding of the CSIRO for that, so ask the ATSB to have that done. Second, observing that finding the aircraft might not prove possible or useful, in parallel go into human factors more. In particular I think that if those closest to potential perpetrators are unwilling to disclose all, they should be obliged to. In particular there are the women closest to the pilots. Then there are the last uses of mobile: what for remains unclear. Then also there are the matching and weighing of possible sequences during the flight with opinions by human factors people as to their likelihood. Just for example suppose a pilot is locked out, fiddles in the MEC then after that has no effect, shuts off the oxygen to the other, who is unaware of this and becomes hypoxic. There would be many others. Discard those that are inconsistent with likely human behaviour or the evidence. Bring all that into the open, despite sensitivities, favouring the interests of passengers’ NOK and travelling public over those who knew the pilots well. I felt the solution – to help get the truth – might be to ask 60 Minutes (U.S. version) to do a story on MH370. I sent them a synopsis of a proposed approach for a piece on MH370. They have not accepted my proposal which means they are not interested (they say if you do not hear from them, that means they are not interested). It did occur to me that 60 Minutes would probably need to wait for Malaysia and ATSB reports before summing up the tragedy and lesson learned and implications. But they could get started. I do think there is one “eureka” emerging: the CSIRO 35S drift analysis recommendation. Not saying we all agree with that. However, I feel the BTO/BFO data may hold the answer. The problem is the assumption of straight level ghost flight from 1840 to the end. I do not think MH370 did that ghost flight, therefore we need to let the BTO/BFO tell us where the plane went, instead of discounting BTO/BFO and trying to fit paths we like better. However, I do speculate the answer probably becomes the crash may be somewhere in the 32-35S proposed search area, probably inside Arc7 where there has been less coverage. Would that not be this? The ‘community’ already pointed to this area soon after the flaperon was found. But let us not cry over ‘spilled milk’. The ATSB and CSIRO made a huge step forward imo. The 32S/35S area covers Broken Ridge and some of its deep trenches. I still think these are the places to look. But this narrative only makes good sence if they are prepared to let go of the unpiloted and high speed dive impact assumptions. Imo the debris and damage shows clearly there was some kind of glide and ditch-like impact involved. And all other evidence shows it must have been a deliberate act from the start (whatever the reasons). 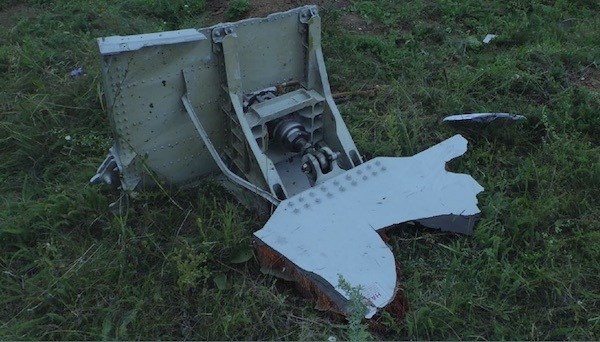 The debris-damage, especially the flaperon and outboard flap section show there must have been a ditch-like event with relatively low vertical speed impact with the plane in a low AoA attitude. Many things @Kenyon has stated as ‘certainties’ in his paper can be interpretated otherwise and in some cases are not correct at all imo. And I think this is understandable for he starts off with the assumption the plane must have been in a very high speed dive and consequently a high speed impact. If you start off with this kind of presumptions you tend to work confirmation-biased ignoring and refuting all other indications against them. He cann’t prove he is right neighter can I for we miss the necessary information. I think the way to go is leaving the assumption/conviction it was a unpiloted flight after FMT and a unpiloted end-flight without a specific goal and then look what could be the best options including a ditch. Confusing, but I am thinking that is Aussie version of 60 Minutes, not shown in USA? I am thinking the USA version of 60 Minutes is a top notch investigative news program that could possibly get to heart of the matter (with FBI etc), with possible impact. The other eureka I speculate we might see, is an attempt by Malaysia to give official position on most likely cause(s), and I am thinking that might be a hijacking by foreign agents. Of course, we’d welcome that if there were evidence, but I am thinking it might be more of a policy opinion on the possible cause. What we are missing from ATSB is the flight path rationale for 32-35S. But I feel like it was a loiter or switchback like at IGARI, then heading south at some later time probably 1941 or shortly later. @TBill. As you imply we really know little about what the Malaysians have done recently other than some debris identification. If they produce a final report without having gone into crew/hijacker human factors (and for my part, in particular a couple of issues I raised earlier) we will all howl but it will be too late. Publicity should be about what the Malaysians are doing and what is expected of them. Actually CSIRO’s newest opinion is that the crash area is most likely between 35S and 36S. However, I am not sure if they are going to release the updated report independently, or more likely, as a part of ATSB’s final report scheduled for the third quater 2017. This plane is 99% above 22S. I’d go even further north – from the initial (as in, not doctored) drift analysis this plane is hardly in the SIO at all. If that is still a possibility after 3 years, they may as well need to include interview (direct one to one interviews and not via middle persons) of all the witnesses including the unfairly treated Maldivian witnesses on the basis of satcom data. In my view they have to do so to be compliant with the ICAO Manual. It is often the case in investigation to have incompatible data but without analysis you ll never know which data set is correct or which scenario matches the coexistance of all the data sets. For me the investigation is only at the begining stage. Data from witnesses, debris and radar are required. The debris could well be planted and already gives conflicting analysis. Any evidence supplied by the MY ought to be regarded with suspicion as their behaviour from the get-go has been that of delay, interference and withholding of information. @HB, Cargo Handler. The US NTSB made formal comments disagreeing with the investigation and findings into the Silk Air FLT 185 crash. I think the grounds for its submission were that it represented the country of manufacture of the Boeing 737 involved. It may be that there can be a formal objection to the MH370 final report from outside investigative agencies with reps accredited or even on behalf of others (passengers, manufacturers etc). There should be a circulation of the draft report for any remarks before publication to involved parties. Those would then require comment by the investigative agency as with Silk Air 185. If the ATSB’s search report is considered part of the final report any objections to it might be taken then. One can indeed questions the objectivity of the investigation given that the person in charge of the initial investigation was actually Defense Minister also acting as Transport Minister. According to this article, he also happened to be the cousin of the acting Prime Minister. From Wikipedia, the functions of Defense Minister in Malaysia include responsiblility for defence, national security, army, navy, hydrography, air force, armed forces, intelligence services, counterintelligence, military intelligence, national service, and veterans affairs. The function of Transport Minister include: road transport, civil aviation, marine, road safety, port authority, railway assets, maritime, air accident investigation, logistic, maritime safety, shipping, rail transport, airport, airline. Basically full hierarchical knowledge and control of the information and the investigation. The objective of the investigation seems to be a need to cover-up what actually happened by circulating as much contradictory ‘evidence’ as possible to muddy the waters and prevent the public finding out what went on. It is looking more and more probable that the main players have succeeded in obfuscating the truth for political/financial benefit. However, it is possible that whistle-blower could appear who will blow the gaff on the whole operation. We will just have to wait and see. I tend to agree. Also this @Kenyon who provided his confirmation-biased analysis on the flaperon seems to refuse to attend the discussion. He did not, to date actualy. There are so many things that don’t fit in his report. I don’t even know to start with and take the effort. A lot of nice pictures and lines based on interpretations and conclusions that have hardly any real substance at all. That’s what a nice looking representation can do. It looks good but has no real substance if you look at it more closely. His silence is telling too imo. Hope it will be significant. The latest in the ocean of inconsistencies is this one. One member of this forum gave me a published paper on B777 200ER performance. This paper states that the maximum achievable lift coefficient is 2.7 (not sure where the author obtained this data). Also @David shared the previous excel based aerodynamic model posted on Jeff s blog. The lift coefficient calculated there is much less than 2.7. If you reverse calculate the Lift force for a lift coefficient of 2.7 at the speed indicated in the simulation You ll find that lift is 4 times the weight of the plane. If this analysis is correct, the wing could not experience G forces more than 4g. Given that Boeing was so proud to publicise their B777 wing tests that demonstrated it could stand 4.7 g dynamic forces it seems that debris did not separate mid air. These simulation files also indicate impact speed of mach 0.8 which further indicate flutter not likely. Then debris separation in mid air seems unlikely. And if for instance the flaperon did not separate mid air, it is still hard to explain the lack of composite shattering and primary structure deformation and hinge fatigue. ChinaAir 006 B747 endured 5.1G during its pull-out from a vertical high speed dive. Again no flaps or other wing related parts seperated due to fluteer or airloads only tail pieces. And only some landing main gear doors seperated while the gear was deployed at high speed in mid flight. I cann’t image a B777 would perform less as being a follow-up of the B747. About the flaperon hinges. They are very strongly mounted on the strong metal structures that make the inboard and outboard structural frames. They are not mounted on the compostite. It’s clear to me the hinges sheared off at their weakest spot at their T-structure from aft to front. Both hinges show this by the angle and their shearing. This force must have come from below. The PCU attachments show a clear breaking to the up-side direction. In both attachement pictures you can see clearly the bottom sides of the attachments leave much more material than the upper sides. Concluding the flaperon must have been forcefully hit upwards to induce this damage and seperation. Thanks. But at first sight it’s disappointing. The shape and features don’t fit any B777 part I can imagine, the color doesn’t fit, the fasteners don’t fit in shape and seperation. I’m afraid if this is all they found it’s something else but not from MH370. Let me help break the silence that seems to be so telling. “seems to refuse to attend the discussion. 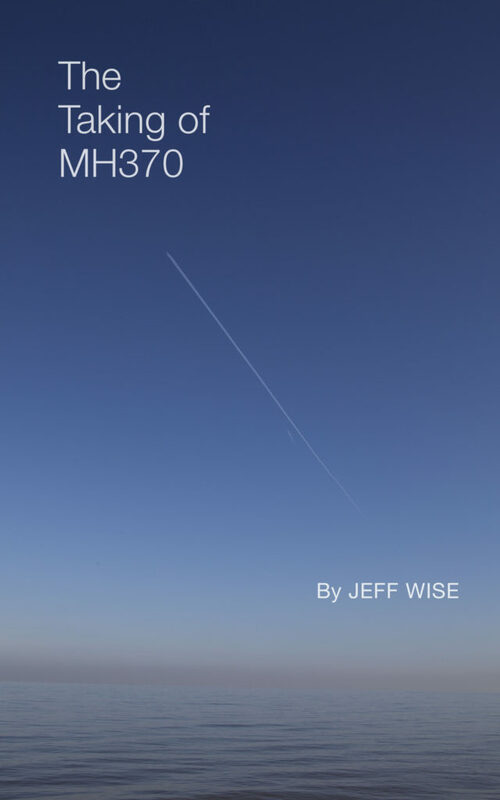 He did not, to date actually.” Incorrect, you can find my participation on Jeff’s blog over the years including this very blog topic “How Did MH370’s Flaperon Come Off?” If there are posts where my contribution would help, or provide positive feedback, I most definitely post. Most of the posts cover ideas or concepts that frankly my contribution would be too interruptive and diminish the momentum of the conversation. Some posts are about topics that are outside of my skill set. It is also my choice not to get into fruitless discussions with people who are mean spirited or trying to stir the pot, or argue with those who have not earnestly invested their own time and energy into trying to contribute to solving the MH370 tragedy. In addition, my available time to put towards MH370 is very limited at this time. “He starts off with the assumption the plane must have been in a very high speed dive and consequently a high-speed impact.” Incorrect, I most certainly did not start the photo analysis with any assumptions in mind. @Tom Kenyon, Your patience and insight is much appreciated. Just to further elaborate. The g values I reported are in the lift direction ie the direction that would cause damage to the wing components. The china air 006 reported are along the cord as it appears from the report. In my opinion, others may disagree but after looking at all this data i would now tend to agree a deep dive is not likely and the logic of no one in control is getting weaker in my opinion. More debris find may yield more clues but it seems no one is searching. In my opinion it would be logical and normal if you would attend a discussion on a topic which is solely based on a report of your hand. And it would be welcomed ofcourse. If your contribution to the discussion would be too interruptive or diminish the momentum of the conversation remains to be seen and I surely doubt this. Anyway many people around here are not that easily intimidated by interruptive arguments and opinions you should know. Especially not from a person who made such an effort to put a report together which is the basis of this topic. I think it’s to be expected and appropriate that you will be called upon some day to defend your report if you keep silent about it in the debat for too long. ‘Summary of Position Statements’ which are in the introduction of your report. If those are not your assumptions your whole report is based on and you are trying to prove, I guess I’m misreading something. If you find the time I hope you can explain. Correction about the B777 wing load test. The reports indicate 154% of 2.5g which is actually 3.85g and not 4.7g as previously mentioned. Appologies for that. You have spent a lot of valuable time and effort in your work! It is appreciated by many of us. Ge Rijn, is a malicious, uneducated and opinionated man. He literally spews entire diatribes of utter nonsense and attacks people on blogs for no good reason other than his own ignorance and stupidity. Many on VI’s blog gave him a good hammering for lacking any skills or ability to put forth any meaningful, substantiated analysis and simply ignore his puerile rants. You are right not to stoop to his level of character and hope you will continue to contribute for the benefit of us readers who do appreciate your work. I back KarenK’s sentiment ……..
Ge Jijn, Rob and a few others are our loud minority who like to shout people down. They will fail. hmm attack on persons are not helpful @Kenyon although some aspects of the report may need further clarifications. Your attempt and contribution has been far greater than the observed official line. It should at least point out to the authorities (here we are talking about the lead investigation team in Malaysia – not ATSB) that hey debris are hard evidence and we can learn something useful from how they failed. If you manage to build a CFD/FEA model let us know. It would be interesting to confirm the forces/stress experienced by the wing components from a number of scenarios. Can you please provide that publication or a link to it? @Ge Rijn, HB, Kenyon. Tom, though I do not agree with your findings of fatigue I think your contribution has been most valuable and useful. Like Ge Rijn I hope you will be able to comment more in due course and invite that on the below. Having thought earlier that air loads at high ‘g’ could well have caused flaperon separation I now have my doubts. If a wing would break at say 6 ‘g’ that would mean the lift on the right flaperon in the neutral position would be about 6 times greater than normal at that wing-break point ( the lift on the left, most likely floating, would be less again). Since I would not expect much lift in the neutral position my expectation is that stresses at its attachments when deployed as a flap would be greater than that, ie it would be designed for more. If so it would not separate under high ‘g’ before the wing failed. Also if mid-air flaperon separation from shock is to stand, the remaining possible cause in my mind, the separation of the recovered closing panels above the two flaperons needs a parallel explanation. Shock causing a similar failure in both wings? Both hit by the flaperons? Hmmmm. Maybe not. So, I have looked again at flutter. The Silk Air Flt 185 crash of a 737 is instructive on that. Taking the NTSB’s side in the investigation (there were no voice or data recordings) at altitude the captain trimmed the horizontal stabiliser nose down to its full manual extent, the aircraft entering a steep dive accelerating into the transonic, engines powered. The altitude scale is 5000 ft per interval, speed 100 knots EAS, the origin being zero. We can see the aircraft exceeded its flutter “analytical clearance” at about 18,000ft and crashed at 620 knots. As a guide, at ISA that would be at M=0.94. Analysis later indicated it would have encountered flutter twice as shown at low altitude, at different frequencies. Parts of the stabilisers and elevators separated in flight as did some rudder skin. One other pitch-control point emerging from the NTSC report is at 2.11.1 where it describes nose-down Mach tuck occurring in the 737 at high cruise speeds and notes also that normally this is trimmed out automatically. If not, light control forces are needed to control it. In a straight dive therefore there is little reason from this to suppose the 777 would reach flutter speeds, unpiloted. Piloted that might be possible, though without engine thrust and full hydraulics plus nose down manual stabiliser trim, all three, in a straight dive that would be doubtful. Given the current explanation for the MH370 final log-on there would be no engine thrust; unless in brief restarts. So besides no appreciable thrust, full hydraulics would depend on the APU run continuing (the incomplete log-on notwithstanding) or that coming from windmilling, probably with PMGs powering hydraulic electrical controls. While this does not cover a dive with roll (which I assume would be unpiloted) we could expect that to lead to a spiral if the roll rate was appreciable and for pitch up to occur still. In a spiral the induced drag from the pitch up would slow acceleration, the extent depending on ‘g’. Were banking to halt with the aircraft inverted, possibly it could exceed flutter speed during pitch up though it could well break up due to ‘g’ before that. I should add that in the NTSC’s report p38 about simulations it relates how, had the nose down stabiliser trim been applied, aileron input could result in a descent time history similar to that of the actual radar tracking. That would have led to an accelerating spiral and a loading of less than 2 G. It notes, “Furthermore, the aircraft would continue in the spiral even when the control forces were relaxed. This would result in a descent at a speed exceeding 1.2 Vd, in agreement with the analysis on the break up of the empennage….” Were a pilot to apply nose down stabiliser trim and aileron to MH370 there could be a like outcome if he had engine thrust and sufficient control but as before, that seems unlikely. In short, again supposing there to be a 737/777 parallel, an unpiloted aircraft would be unlikely to reach flutter speeds unless during an inverted pitch up and then subject to overstress not intruding. Without nose down stabiliser trim, engine thrust and hydraulics to supplement the RAT it may well be that a piloted aircraft likewise could not reach flutter speeds or even resist a pitch up. However I draw attention to the ATSB’s Search and Debris Update of 2nd Nov 2016. At p14, about most recent Boeing simulations it states, “Some simulated scenarios also recorded descent rates that were outside the aircraft’s certified flight envelope”, presumably that being the ‘1.2 Vn’ as per Fig 15 above for the 737. Left unclear though is whether ‘g’ forces would have caused a break up during such descents. 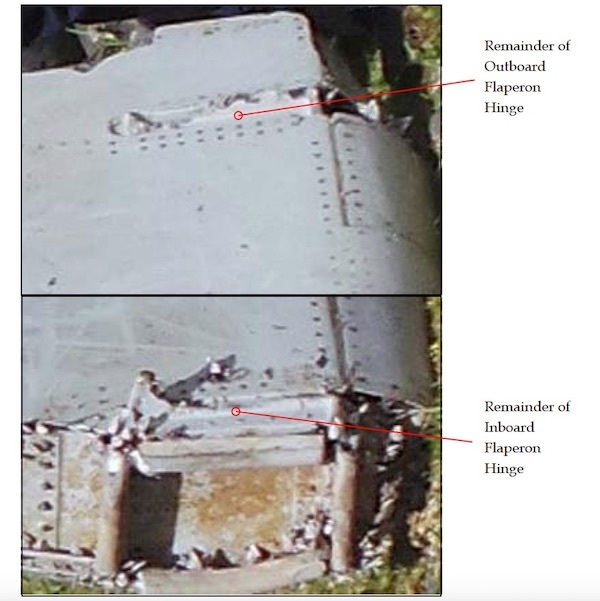 Finally (hello again Tom) about the NTSC report, please note that despite the 737 apparently losing empennage parts in mid-air due to flutter at 2.2.1 it states, “In the recovered parts no evidence was found which could be attributed to fatigue failure”. Where this all leaves my earlier analysis of right outer flap damage following flaperon impact is that there remain just two likely possibilities, namely a wing break during a pitch up or a flaps-up ditching (with or without wing break), the latter requiring impact forces from the flaperon that ditching air speed might not deliver. As currently it stands, the separation of the flaperon closing panels being due to a mid-air wing break now adds uncertainty to that too. Please note that in earlier work I have ruled out high speed impact with the sea, that being incompatible with the flap damage being sequential, ie not instantaneous. While the above outcome remains tentative and inconclusive, it progresses, slowly. All this is not just about whether the flap damage indicated there was a ditching or not but also whether it can confirm there was no pilot, or otherwise. So far, it can do neither though if sign of flutter is found that would favour there having been a pilot, IMO. Your further input on this model will be most welcomed. Note the correction on the Ultimate Load test to be failure at 3.85g. i am happy for Jeff to give you my email. To set something straight. I do respect @Kenyon’s report and the effort he put in to it. It’s not new. It’s around for a long time now (since december 2015) and basically still the same. Back then same kind of critics and questions were put forward by several people (including me ofcourse) but in my memory @Kenyon never really answered or entered the discussion about it in those days either. And I think that’s not correct when you publish such a detailed analysis with such boldly stated assumptions in it. That’s why I tried to ‘wake him up’ and invite him to join the discussion about his own paper. I have no mean intentions at all but refuse to be mister Nice Guy sometimes in stating my opinion. I’m sure @Kenyon can handle this. @HB: Thank you for your reference. I wouldn’t recommend it. At low altitude the CLmax with flaps retracted is of the order of 1.4, and with Flaps30 it is about 2.33. So Ge Rijn, myself and a few others are the loud minority. Quite honestly, I am shocked to hear that, and hurt by it too. I had never thought of myself as being one of the loud minority. One of the informed, rational minority, yes. But, then again, I can be intolerant of others, intellectually less well endowed than my self. I apologise unreservedly if I cause you undue offence. @Gysbreght. That s about right and more or less matching these a bit lower though. Are you talking about B777-200 ER specifically? The question is how to best estimate the Lift force in a deep dive situation given the AoA would not be optimum. So my idea was to try from a Clmax approach as a conservative approach. I ll be happy if you could share Cl correlations for the B777-200 ER at different altitude levels if such data is available in public domain. @HB: Are you talking about B777-200 ER specifically? The 1.4 is the value that your source erroneously attributes to flaps down, but similar to the flaps-up value of a comparable aircraft. The CLmax of 2.33 for flaps down corresponds to VREF30/1.23, where VREF30 is given in the FCOM for the B777-200ER specifically. Right so here we are talking about 1.4 meaning even less lift. @HB: The MH370 ZFW was 174 metric tonnes. 5g requires a lift force of 5×174 = 870 tonnes, i.e. with CL=1.4 an airspeed of 300 kt CAS at sealevel. Agreed high g cannot be ruled out on basis of max Cl. That excel based simulation calculated a Cl of 0.7 at M roughly 4 and then the lift less than 2 g was kept constant but with speed this of course will increased by the square relationship. So it did not help with the g estimation. I presume the Cl is much lower than Clmax in uncontrolled dive as Optimum angle of attack cannot be maintained. I am also wondering how the simulators treat the Cl values in a dive situation. Is there any established guideline for Cl estimation in such cases? I admit my previous analysis was incorrect as I simply back calculate the Lift but did not adjust the speed to higher speeds. Thanks Gysbreght for your input. After further reading on the effects of high speed dive on Cl value, the Clmax correlation may not lead to any conclusion. Cl values need to be estimated more accuraterly for high speed situations. The main reason is the compressibility that would develop underneath the wing and affect the lift coefficient down. This issues was hitorically revealed in WWII where pilots experienced difficulties from recovery from the dive as the compressibility tended to pitch the nose down. The compressibility is negligible at low speed which is the basis of Clmax. Not sure where that boundary is; 300 kt CAS seems low though. Maybe with this in mind, the constant lift approach as in this excel model is conservative. Aerodynamic engineers views are welcome. Intuitively, excessive lift forces do not seem right given the Design Dive Speed is estimated at 1.08. Literature suggest that Cl value at high speed would be different due to compressibility issue. So that correlation you mention should not be used for high speed dive. What is your view on this? Compressibility effects become more pronounced with increasing Mach number. For constant CAS Mach number increases with altitude, therefore compressibiity effects become more pronounced with increasing altitude. With a speed of 300 knots at sealevel the Mach number is 0.45 and the compressibility effect on CLmax is not zero but is quite small and does not change the principle. Thanks. It would be good for the investigation to spend more time on it to evaluate the forces on the wing components and correlate with the damage. So far they provided only a couple of qualitatve arguments. New debris from MH370 found in Seychelles, possibly from the engine cowling. Well the starting point is at high altitude and probably high speed. This for me is the main difference in principle. Whether that makes a difference or not i dont know myself. The other question is whether the optimum AoA can be achieved or is likely in an uncontrolled situation may need to be addressed. The China Airline 006 did for some reason not experience those forces. I am also wondering if there is a cicumstancial probability involved in this scenario too.